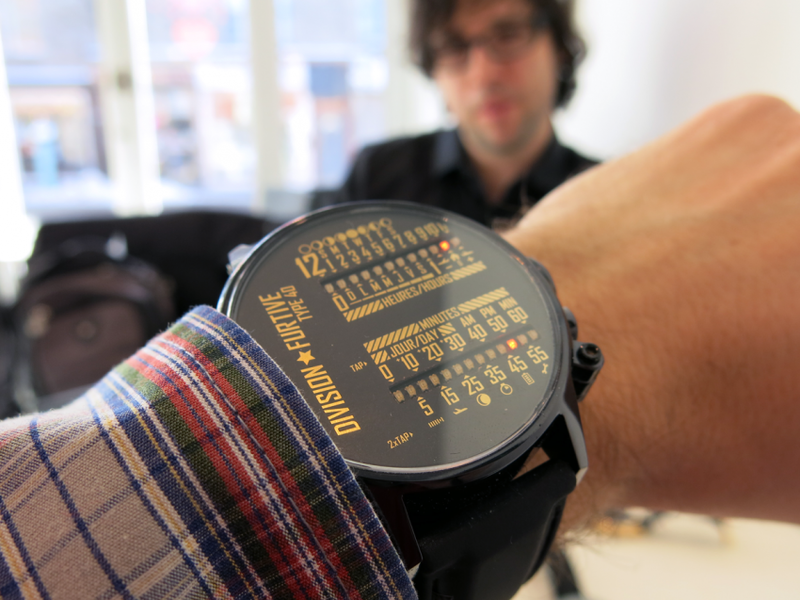 Wrist shot of the Division Furtive Type 40 dual linear LED-display watch. 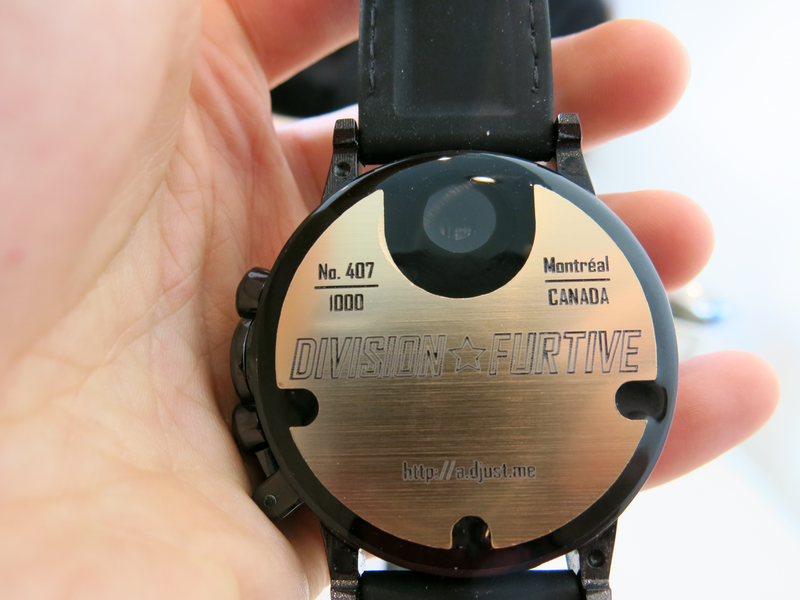 I knew about Division Furtive since 2012 when I stumbled on their project on Kickstarter but for a long time, I did not had the chance to meet Gabriel Ménard, the man behind this project. Finally the day came when I was heading to a tea house in the creative core of Montreal, the Plateau Mont Royal to meet Gabriel and find out more about Division Furtive, it’s past, present and future. The story of Division Furtive starts in 2011, when Gabriel — who holds a a bachelor’s degree in microelectronics and master’s degree in image processing from McGill University in Montreal — was just finishing a contract in micro-electronics on the West Coast of the U.S. and got really fed up with mass production. He was looking to develop his own product, designed by himself and this is where he started to work on the Type 46, a dual linear electromechanical watch. This is when Gabriel realized that price-wise to go all the way mechanic is quite a steep hill to climb and he started experimenting with alternative possibilities, resulting in his must successful model, the Division Furtive Type 40, also with a dual linear display, but with LED lights instead of the mechanical cursor found on the Type 46. Division Furtive Type 40, Type 40 Silver Edition and the prototype of the Type 46. Coming from the field of electronics and not having any contacts in the world of watchmaking, the biggest challenge of those early days was to find the sources for the parts necessary to build the watch. But these difficulties are now left behind and the Type 40 and its higher end version, the Type 40 Silver Edition raised quite a lot interest among watch enthusiasts and they are sold at the same paste as they are produced. While the production of the Type 46 was stopped in the early stages of the project, it was his first watch with an electromechanical mechanism witch permitted Gabriel to learn the ins and outs of producing a watch and with the Type 40 he was able to use all this experience combined with his knowledge of microelectronics engineering. Gabriel Ménard preparing to demonstrate how to set the time on a Division Furtive Type 40. 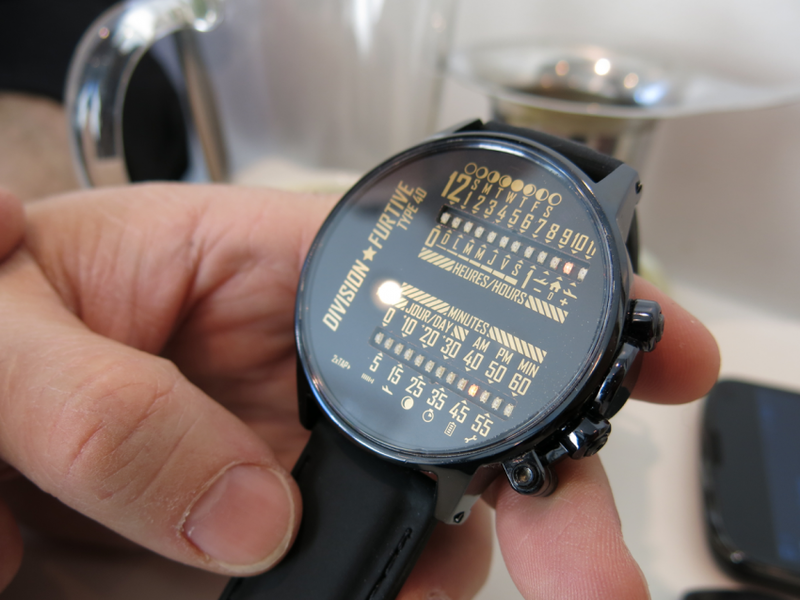 One of the unique features of the Division Furtive models is the way of setting the watch, which is done through the light signals emitted by a smart phone or any computer LCD screen. Because of this, the watch has a long list of advanced features, such as: day, a.m. or p.m. indicator, triple time zone, phase of the moon, chronometer, battery life indicator and time until next maintenance. Having such a long list of functionalities while being a battery powered quartz watch, I asked him if he would call it a smart watch, but Gabriel answer was a straight no. 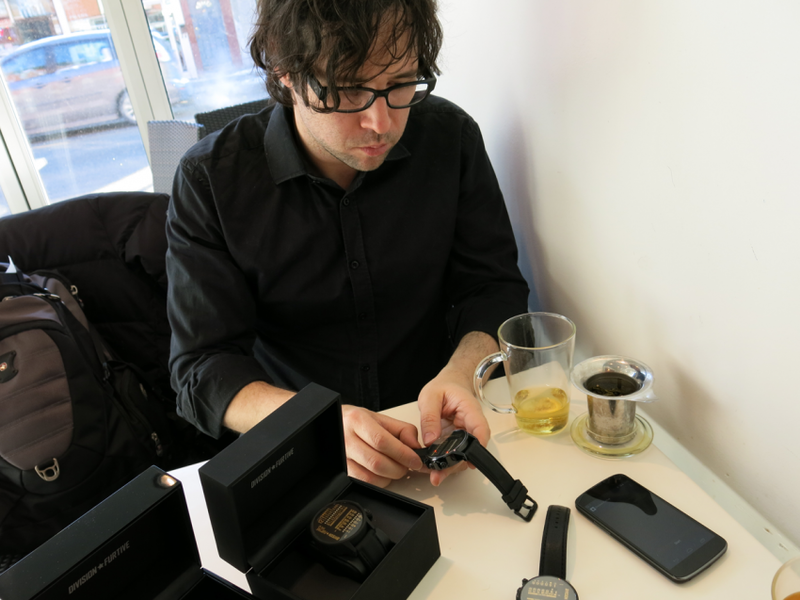 He wants to stay away from the smart watch label, which he sees as niche where the features are driving the technology and it’s missing the design accessory aspect that is so important for Division Furtive. He prefers to call his pieces as “dumb-watches” that boast a technological know-how to make it more interesting. You will never find Wi-Fi or Bluetooth in a Division Furtive, he would rather spend time and energy in refining the look and finding new ways to display time and other functionalities. He’s not into making tine cell phones, but watches. He’s not looking to fight a battle agains Apple or Samsung, he’s a player in the fashion industry. He wants to create art with electronics, to show that it can be beautiful. When designing the watch, Gabriel was looking to streamline the shape of the watch by eliminating the buttons, the watch responds to taps on the front glass, with two modes. Tap for the top functionalities and double tap for the bottom ones. At first it might look a bit cryptic, but with time, once you master the logic behind it, it becomes quite fun checking the time or going trough the different functionalities of the watch and for sure it’s a great conversation starter. Many of Division Furtive’s clients are watch collectors and the feedback he got from them is that they have the Type 40 quite often on their wrist, because of its design, functionalities and it’s size (50 mm / 16 mm) won’t go unnoticed. To make it easy to own, the Type 40 uses AAA batteries than can easily be found no matter where you are in the world. Here is a short video demonstrating the procedure of battery change. You can also see how the different functionalities are displayed and switched by using simple taps or double taps. As you could see, setting and reading the time on Division Furtive pieces is not done in the usual way, I find it to be very much imbued by the engineering background of Gabriel and I would say these are the ultimate geek watches. A geek in the good sense of ingenuity, passion for technology, curiosity and exploring the limits of a machine. The Division Furtive story doesn’t end here, in the near future Gabriel will launch another Kickstarter campaign that he’s busy preparing. Before launching it, he wants to make sure that he has all the necessary parts for pre-production, in order to satisfy the demand and be able to build the watches in the shortest time possible, so that the backers won’t have to wait too long. There also a new model in preparation that Gabriel was kind enough to show me in SolidWorks that will have several facelifts, mostly minor ergonomic improvements of the current Type 40. 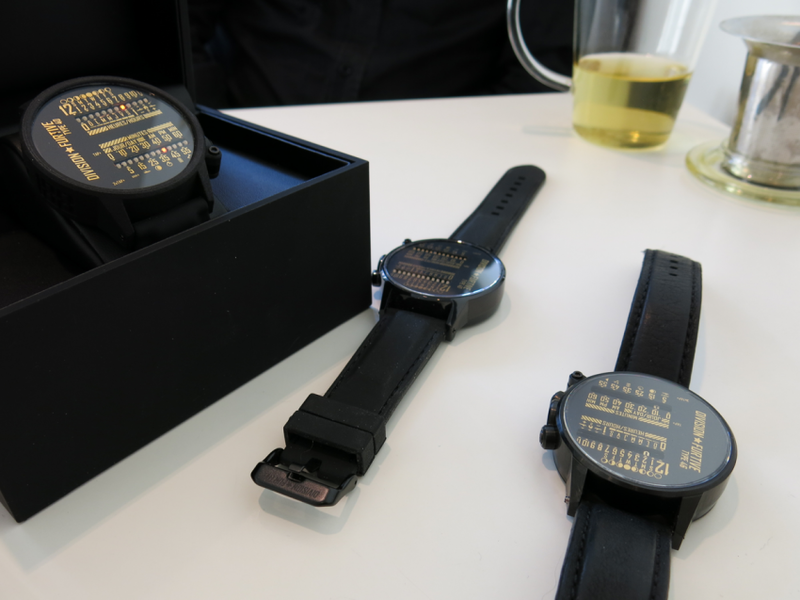 To find out more about Division Furtive, or if you’re a fashion-conscious techie looking to order one of these watches, head over to www.division-furtive.com.